In early 2013, Slack reached a critical turning point. The company had just begun rolling out its young team-collaboration product to more and more customers when it started facing some unexpected turbulence. Initially, Slack had rolled out its product to relatively small teams, similar in size to Slack itself. But when the product started gaining traction with larger companies, such as Rdio, the results weren’t as heartening. With this many users, Slack suddenly seemed less sleek and effective than it had when it was used by a much smaller team. Essential features no longer performed as envisioned, unforeseen problems arose, and the overall user experience seemed to take a hit. “Suddenly we saw what the product looked like from the perspective of a much larger team, and it was pretty gnarly,” Butterfield told Fast Company. This was no small problem. The company knew that if it was going to make it big, it was going to need to meet the needs of larger, higher-paying customers. So the company buckled down and started looking at their product from a new perspective: through the eyes of a much bigger company. Slack quickly corrected course, went on to receive a valuation of nearly $3 billion, and the rest, as they say, is history. Except, of course, it’s not. Hidden inside this small hurdle on the path to Slack’s success is a very important lesson: SaaS companies must evolve their product to suit the needs of larger companies if they want to do something truly unique. Staying within your wheelhouse and selling only to customers like yourself ‒ especially in the SaaS landscape ‒ is a recipe for failure. In fact, in all the research we’ve done about the best SaaS companies, we’ve found that one of the most effective things you can do is iterate your product to gain a foothold in a new target market. This is especially true if you’re trying to raise your average sales price (ASP) by selling to larger companies, just as Slack was. Like Slack, many SaaS businesses know that they eventually need to move upmarket if they want to hit their goals. You might feel like your comfort zone is SMBs, but if you want to achieve exit velocity or protect yourself against competition from above, you eventually need to start selling to bigger companies. Although this has one huge advantage ‒ it will increase your ASP, thereby expanding your revenue stream ‒ it also has one significant drawback: you may start losing opportunities for reasons you’ve never accounted before. As the story from Slack shows, larger companies use products differently (and put different stresses on software) than smaller companies, so it can be extremely risky to jump headfirst into selling to enterprise businesses. 1) Why Are We Losing Bigger Deals? When Slack first started receiving feedback from larger customers, it was surprised by some of the comments it was getting. Larger companies complained that channel creation was getting out of control, and that new hires felt irretrievably lost when logging onto Slack for the first time, according to Fast Company. These were complaints that Butterfield and his team were not used to. However, in the end it was good news ‒ the product team was able to address the issues and position Slack as a team-communication platform for companies of all sizes. When you start targeting larger buyers, you should follow suit. Carefully track all of the reasons large companies are giving you for NOT buying your product. Some of these loss reasons ‒ timing, authority, budget, etc. ‒ may not be related to company size at all, but others ‒ like security concerns, frequent crashes, or missing features ‒ are often indications of where your product is failing larger companies. 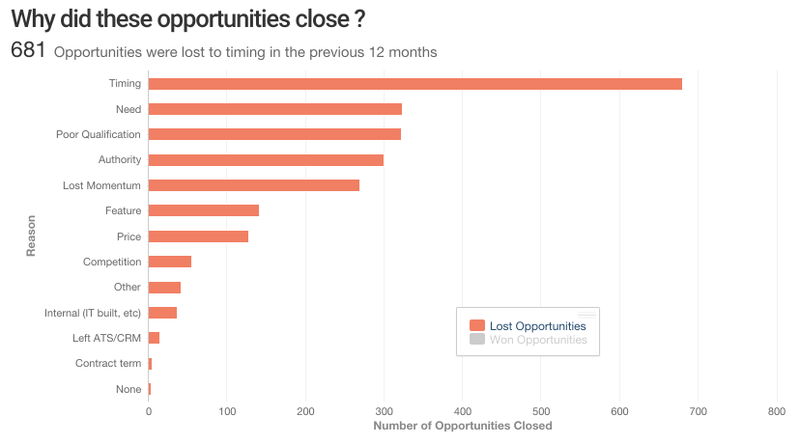 Analyze your loss reasons (and sort them by opportunity size) to identify the common complaints you’re getting from larger companies. If you’re trying to sell to larger companies, you will need to iterate your product in these areas to have the most success. Slack used this very tactic when it decided last fall to introduce a new feature into its product. The feature provided enterprise-size companies with the ability to search employees’ private discussions. According to Business Insider, this wasn’t something Slack had originally intended to do, but the demand for this feature became so loud that, last fall, Slack recognized the urgency and quickly added the feature. Doing so made the product much more valuable to large companies, thereby providing slack with another foothold in the enterprise market. Slack paid attention to the feedback it was getting from larger companies ‒ who wanted to buy the product but had size-specific obstacles in the way ‒ and responded to them with integral product updates that made for a much better fit. Once you start selling to larger customers though, you can no longer afford to ignore the feedback you’re hearing from customers. 2) What Are Our Customer Service Reps Hearing? Once you start gaining traction when moving upmarket, you need to move beyond just listening to your sales reps and start listening to your customer service reps. Your first few large customers can serve as the perfect test cases for how your product serves (or fails to serve) their needs. If your customer service reps are flooded with the same few support or feature requests, you have likely identified the right areas for your product team to prioritize. At Slack, Butterfield and the other executives make it a priority to be “active listeners” when trying to find areas to improve their product to meet the needs of their growing ‒ and changing ‒ customer base. Even if what they hear goes against their best instincts. “Sometimes you will get feedback that is contrary to your vision,” Butterfield told Fast Company. But that can’t stop you from constantly evolving your product. Especially if you’re going after a more powerful segment of your target market. The move upmarket doesn’t happen overnight, and it is important to take the feedback you receive from your initial enterprise customers and use it to incrementally tailor your product to their needs. Doing so will make your product a better fit for your new target market, but it will also help you better understand how to position your product as you ramp up your sales efforts to this segment. 3) Do We Have a Value Proposition for Bigger Buyers? Once you start iterating your product in an effort to move upmarket, it’s time to use these changes ‒ and the lessons you’ve learned in the process ‒ to influence the way your sales reps sell to bigger prospects. Even if you’re diligent about iterating your product based on feedback, it won’t do any good if you can’t get people to actually buy ‒ or even try ‒ your product. That’s why you need to coach your sales reps to use tailored value propositions depending on who they’re talking to. If you learn, for example, that larger customer are especially concerned with their ability to modify your product to their particular needs, you should make sure your sales reps address this concern before it’s even raised. Larger companies are not going to buy a product that they believe is designed for the little guys, so work with your reps to make sure they’re positioning the product in the best light possible for large opportunities. Slack always had grand ambitions, even when it was only serving a modest part of the market. To reach their goals, they knew they had to be flexible and proactive about tailoring their product to an evolving customer profile. If you want to start reaching ‒ and acquiring ‒ larger customers, you need to think the same way.